Looking out my window this morning, I see gray clouds and a wintery-looking Phoenix. 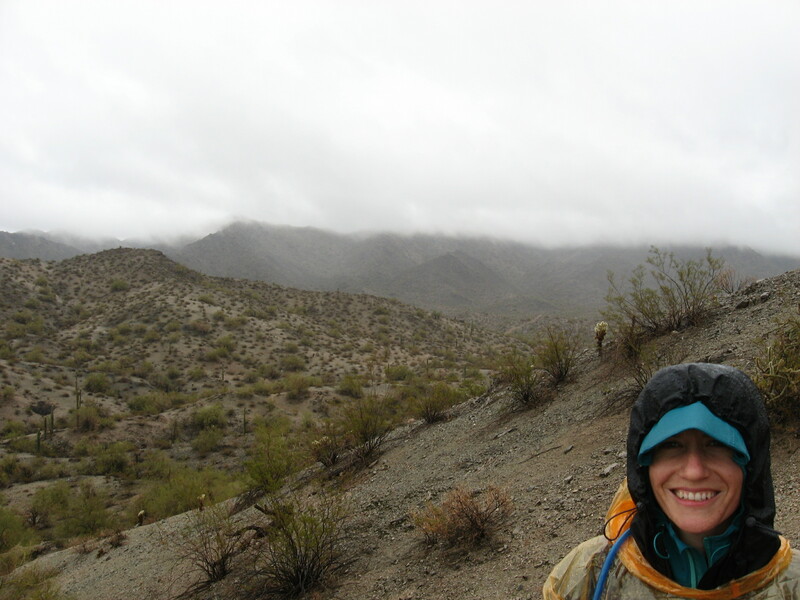 One might think that on a day like today, a Phoenix hiker would be dying to hit the trails. It’s better to hike in the cool weather, right? ​This hiker prefers hiking in the summer. I’d much rather trek through the baked dirt in the disgustingly hot evenings wearing practically nothing and sweating like a maniac than hike in the cold — bundled up and clammy with snot dripping from my freezing nose. Wow. Hiking is not very attractive. 1. Layer with as many zip-up clothing options as possible With fuzzy beanies, visors, sunglasses and other cumbersome accessories, you’re not going to want to keep pulling something over your head that musses up your hats and glasses. Zippers are your friends. 2. Bring a snot rag With a cold nose, you’ll start to drip watery snot out of your nose. It’s super gross and it’s really freaking annoying. The only way to avoid this is to keep a snot rag on hand and constantly blow your boogers out of your head. You may as well use an old bandanna. A tissue will just get shoved into your backpack or pocket only to be discovered later. Gross. 3. Bring a non-snot rag bandanna This is essential. If you find yourself feeling too chilly around your neck or head, this thing can be fashioned into hat, ear-warmer, or scarf. Of course, do not confuse it with No. 2. 4. Cover your ears This may only apply to me because I’ve got ugly monkey ears that poke out of my head but those things can catch a lot of wind. Then they freeze and I experience the most painful freaking headache in the world. Keep ‘em fettered if you can. 5. Bring a tissue and a zip lock baggy (if you’re a girl) Another thing I hate about hiking in the cold: you don’t sweat out your water consumption so you have to pee in the desert. This is the suckiest. Especially for chicks. And it’s not like there are big bushes in the desert you can effectively hide behind. Again, if it’s summer, this is not a problem at all. One time I hiked a 10.5 trail in 100 degree weather and didn’t go pee once. It was beautiful. Anyway, you should be able to guess what the tissue and the zip lock bag are for…don’t litter your pee rag. 6. Remember to drink water Duh, right? But I actually get more dehydrated on winter hikes because it’s so easy to forget to chug water when you’re not at risk of heat stroke. Plus, I don’t like to drink water on the trail because then it brings me to tip No. 5. I can’t win! 7. Bring your camera Ok, I admit it. The desert is more beautiful in the winter sun … assuming you have time between pee breaks and snot-blowing to notice. 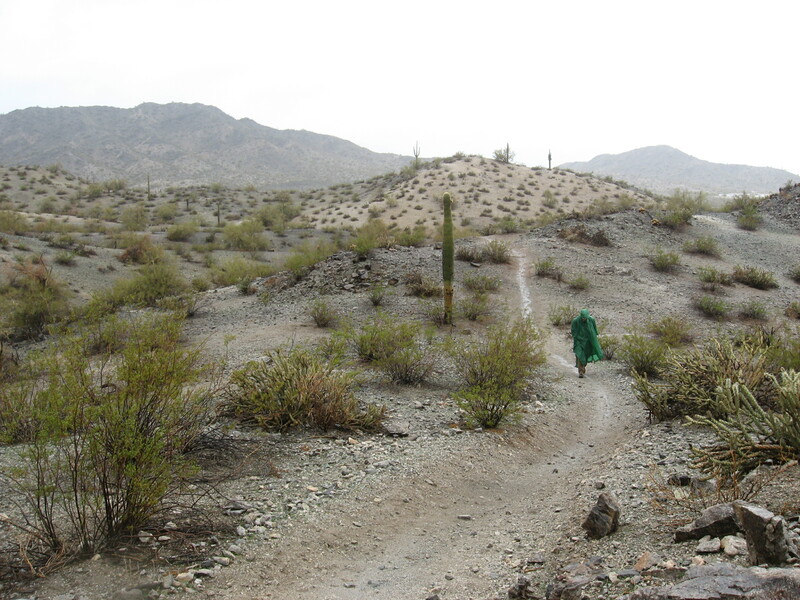 ***This blog post originally appeared on The Phoenix New Times website way back in 2010 when I had no idea I’d ever write a hiking book. I stand by what I wrote with just one caveat: winter hiking is truly spectacular because, unlike summer, I can plan glorious, 10-15 mile hikes that take all day. Also, now that I published a book with an entire chapter devoted to safety, I feel it’s my responsibility to mention that my summer hikes only take place in the early morning or at dusk because hiking midday in the summer is too dangerous. Also, if you hike a trail of any length in 100-degree weather, please, please, please be sure to bring plenty of water. I take 3 liters for any trails over 5 miles, no matter what time of year. And when it’s warm, I take 3 liters plus a large water bottle, sometimes two. Okay, I’ll stop now! Thank you. Very helpful advice. Does hot chocolates taste good after a hike in the cold? Or hot cider? Or rather hot cider with brandy?